Opening at the IFC Center in NY on June 5, “24 City” is the latest envelope-pushing movie by Jia Zhang-ke. Incorporating fictional elements, this documentary casts a cold and clinical eye on the new China and expresses nostalgia for the Maoist system symbolized by an actual state-owned munitions factory replete with “Iron rice bowl” support pillars. Named “Factory 240”, as an internal security code for the Chengdu Engine Group, it is about to be relocated in order to make room for an enormous real estate development geared to China’s rising professional classes and called “24 City”. The movie consists of interviews with the actual workers, all male, middle-aged, and harboring sympathies for the Maoist system to one degree or another, as well as with three actresses who narrate experiences in line with the real workers. This device allows Zhang-ke to highlight certain themes crucial to the telling of this story. His last film “Still Life” was a fictional work that examined the horrific impact of the Three Gorges Dam. “24 City” is more oblique. Like “Still Life”, it is unmistakably hostile to the rapid “advances” that have left the countryside immiserated and workers stripped of all the protections they once enjoyed under the admittedly repressive Maoist system but the interviewees focus on their private lives and their experiences as workers rather than reflect upon the changes sweeping China. Like the pensioners in Soviet Russia who lived, fought and suffered through WWII, the Factory 24 workers have vivid recollections of their role in a revolutionary society. The oldest recalls working behind Red Army lines in the 1940s in order to keep the fighters armed. Younger workers talk about fulfilling their duty during the Korean War and Vietnam War. For these workers, a job was more than a job. It was a way to defend their revolution and those of brother and sister workers. Throughout the movie we are reminded of how the factory kept workers bonded together beyond the factory floor. One 40ish worker is seen shooting hoops at a factory basketball court. At the end of the movie the court is demolished in order to make way for new luxury apartments. We also see a group of women, real workers not actresses, rehearsing a “People’s” opera from the 1950s. China may have moved on but they have not. Toward the very end of the movie we see the entire workforce singing “The International”. It is in a word deeply inspiring. The stories of these characters, both real and fictional, center on a state-owned factory which supplies the Air Force and other sectors of the military. The factory was founded 60 years ago, and was moved to Chengdu City 50 years ago. It has weathered all of the successive political movements under communist government. I’m not interested in chronicling this history as such, but rather in seeing how a century of experiments with Socialism has impacted on the fate of Chinese people. To understand the complexity of these social changes, we need to listen to the direct and in-depth testimonies of the people who lived through them. And listen we should to their voices in this important documentary that opens on June 5th at the IFC center. In 2000, I was invited to campus for a junior post in Romanticism at Bard. The year before, I had gone on the market ABD and had been fortunate to land a tenure-track post at a comprehensive university in a small city in the midwest. I loved my colleagues and most of my students, but my wife felt very isolated from our family on the East Coast and her job (also in the dept.) paid pitifully. So we decided to go on the market again, with doctorate now in hand. So: Once I arrived at Bard, I was thrilled with the faculty and students that I met. Engaging, humane, very smart. And the campus is lovely. President Botstein, however, proved problematic. He interviews all candidates, junior and senior alike, and so I dutifully reported to his on-campus house and cooled my heels on his front steps for 30 minutes. When he finally arrived, he ushered me into the house and went to retrieve my file. He then read it (apparently for the first time) while I was sitting there and asked me: So, are you married? The next question: What does your wife do? Followed by: What do your parents do? Where are your grandparents from? Of course, all of these questions run afoul of MLA guidelines and indeed any professional code, and I could have terminated the interview right there. But with no other job offers yet, this would have meant scotching a chance to teach at a great place. So I answered his questions (more on that later). Then, he noticed I had taught literary theory and proceeded to attack it as the worst thing that has happened to the humanities in 30 years. I admitted the field’s excesses while defending the value of the questions it raised. I can’t recall much of the rest of the interview. In any case, after 40 minutes or so, he shook my hand and told me I had made a good impression. At the dinner with the search cmte. afterward, they were elated. Apparently, Botstein often terminates interviews quickly, so that I had survived to the end was a good sign. So I went on to another campus interview–at the school I am now fortunate to work at–and waited for a phone call. Nothing for two weeks. So I called the chair of the Bard search and she told me that I had been the unanimous first choice of the committee but that the president had insisted that they hire their second choice for reasons he did not deign to clarify. Said second choice had accepted, and so that was that. I thanked the chair for divulging this info–she certainly didn’t have to do so–and turned my attention to the other school where I was still in the running. Two days later, the chair called back and asked if I was still interested in the job; the president’s selected candidate had decided to take another post. Yes, I said, very much so, although I hope she understood that I was not as enthusiastic about the senior administration as I had been and would need some assurance that he wouldn’t be invested in my failure if I did end up coming. She called the next day with bad news. Pres. Botstein again refused to hire me. She asked if it was because I hadn’t yet published much. No, that was OK. Was it that I hadn’t come from Harvard and Yale? No, he knew that my program was top-notch. Well, she then said something like: If you can’t give us a good reason why, then we think we should have the right to choose our own colleagues. Pres. Botstein then apparently exploded, declared that she lacked “the moral passion that I have for this institution” and shut down the search. They didn’t hire the next couple years either, I believe. What Pres. Botstein found so objectionable about me is impossible to determine. Theories from members of the search committee who contacted me to commiserate ranged from widely, from the somewhat unhelpful “he’s crazy” to various forms of snobbery–the fact that I had even spent a year at a relatively undistinguished university in the midwest told against me–to his objection to my involvement to help workers at my graduate school get a living wage. It doesn’t really matter. The point is that anyone applying for a job at Bard should know that it’s a wonderful place in a great many respects. And, to be fairer to him than he deserves, Pres. Botstein, has done much to raise its profile and strengthen the place. But my story is hardly the only one that paints him as an arbitrary, tyrannical figure, and so anyone accepting a post there should walk in with her or his eyes open. I hope this helps in that regard. P. S. Things turned out very well for me; that same year, I received an offer at a research university in a big city on the East Coast and love it here. I’m up for tenure this year and seem very likely to get it. I am in academia, but I have never worked at or applied for a position at Bard myself. However, I grew up in the vicinity of Bard and have several family members and family friends who work there. I would like to confirm that the complaints about hiring and tenure practices are likely not just the ventings of folks who didn’t get hired or tenured. It’s true, all institutions have their forms of dysfunction. But Bard is an unusual institution in that it has been run by the same president for the last 30+ years (since Botstein himself was only 30 years old) and has a tendency to run the place like his own personal fiefdom. To his credit, he has done amazing things for the college both in terms of improving its academic standing and bringing lots of fantastic resources to the place. But I have also heard numerous stories via my connections on Bard staff that it is very hard to get tenure and that he makes no qualms about getting personally involved in tenure decisions. That said, I hear great things about Bard students. And I’ve taken several classes there myself (both during high school and before applying to grad schools) and found them to be excellent. RE: Bard: I mentioned to my director all the blathering about the Bard Pres. My director’s response: “he is crazy, but he’s also brilliant.” Response: Leon Botstein is a brilliant fundraiser, a mediocre conductor, and a tyrant in the classroom. In short, an academic sociopath. Problem is, he runs the joint. “Offshore” might not be the first movie about Indian call center workers—“Slumdog Millionaire” has that distinction—but surely this dark comedy is the first produced by Indians that deals with the cultural and economic dislocations, not to speak of the outright racism, when they get these jobs as a result of outsourcing. As a joint Indian-U.S. production, the movie tries to tell both sides of a story that is all the more topical given the current economic downturn. It begins with a visit of Voxx call center executive Ajay Tiwari (Sid Makkar) to the offices of Fairfax Furniture in Detroit in order to line up a deal to relocate their call center to Mumbai where it will be staffed by Indians. But before the move can be consummated, it will be necessary for a cadre of Voxx workers to be trained at Fairfax headquarters where they will be on a forced march to learn the model line in two months. Voxx had proposed a nine month preparatory period but the Fairfax bosses were anxious to cut costs as soon as possible. The three Indian workers are given the cold shoulder in the company cafeteria and are convenient scapegoats for the long-time employees who are on their way out. Even worse, the company trainer makes their daily sessions a hell on earth demanding instant answers to obscure questions about how to assemble a coffee table, etc. The Indians are models of perseverance and good will but come close to breaking on a daily basis. Almost everyone these days has been personally touched by outsourcing, whether as a customer calling into a call center for service or as a worker who has lost their job to an offshore company. The concept resonates with people on both sides of the ocean. “Food, Inc.” is a powerful indictment of corporate farming that opens at the Film Forum in New York on June 12th. Inspired by the writings of Eric Schosser (“Fast Food Nation”) and Michael Pollan (“The Omnivore’s Dilemma”), who provide a kind of tag-team running commentary throughout the documentary directed by Robert Kenner, it is the definitive statement on how America produces crappy food to the detriment of the people who eat it, the animals who are treated cruelly in farms and slaughterhouses, and the largely immigrant workforce that labors in unsafe and low wage conditions. The only benefactors it would appear are the men who run Monsanto, Purdue, Smithfield and a small group of other huge multinationals that only see food as the ultimate commodity. When they look at a tomato, they don’t see something to eat but something to turn into a dollar no matter the consequences to society. While I have been paying close attention to these issues for well over a decade, I was surprised to learn that I only knew half the story. It is far worse than I imagined, especially when you are dealing with camera images rather than words on a page. I was shocked to see what chickens raised in factory conditions look like. The film’s producer went to dozens of large-scale chicken farmers who were under contract to Purdue or Tyson to get permission to film inside a chicken coop (a warehouse would describe it better) but were thwarted each time, only finally to get Carole Morison—a Purdue supplier—to allow them inside even if it meant the end of her business. She was disgusted by what was taking place and wanted to get it off of her chest. She had already put up screened windows so her chickens could see daylight over the objections of Purdue, but had no control over how the animals were raised. The chickens had been bred to have larger breasts and mature twice as fast as normal with the intention of supplying the supermarkets with a more cost-effective product. What this does not take into account is the inability of a hen to walk properly with the extra weight on top placed on spindly underdeveloped legs. As a consequence, the sheds were filled with crippled hens crawling about the floor, often close to death or already dead. The floor of the warehouse was littered with these casualties to the profit nexus and their feces. No wonder Purdue and Tyson didn’t want you to see how your food looked before it came to the meat bins at your local supermarket. Despite the grizzly aspect of factory farming that is depicted throughout the film in a kind of homage to Upton Sinclair’s “The Jungle”, the branding for these commodities tries to evoke a long-lost period when farming was a far more local and organic mode of production. The pictures on the labels for well-known food products make you think you have been transported to Dorothy’s farm in the Wizard of Oz when the reality behind the label is much more like Charlie Chaplin’s “Modern Times”. In one particularly grotesque scene, we are in the control room of a mega-corporation where a bank of computers oversees the production of ground beef at various far-flung farms under its control. The key to success, the owners tell us, is that the beef is sterilized with chemicals in order to prevent e-coli disease. Apparently this is exactly what Burger King et al are looking for since they anticipate that more than 90 percent of all fast food burger patties will be produced this way in a few years. Unfortunately, Barbara Kowalcyk, one of the interviewees, was not fortunate enough to have had one of these chemically treated hamburgers served to Kevin, her 2 ½ year old son, on a vacation some years ago. The meat carried e-coli bacteria that killed him after several days of agony in a hospital bed. Now she campaigns to see “Kevin’s Law” passed in order to close down any plants that have repeated violations of contaminated meat. Surprise, surprise. Washington has not seen fit to pass the bill. — Tony Airosa, chief dairy purchaser for the nation’s largest retailer, Wal-Mart, which recently began carrying organically-produced food in its store. Wal-Mart has since stopped carrying milk containing growth hormone. Despite these criticisms, I strongly recommend “Food, Inc.” that opens at the Film Forum in New York on June 12th. I usually don’t pay much attention to the Communist Party USA, but a reference made by Doug Henwood (Mr. Featherstone) on his LBO-Talk mailing list to an attack by the Communist Party on the excellent journalist and human being Liza Featherstone prompted me to say a word or two, especially since the CPUSA still has a significant presence on the American left. The article, written by John Wojcik, appears in the People’s Daily World dated 5/26 under the title “Rumor of card check’s ‘death’ is greatly exaggerated”. One story by Liza Featherstone published May 24 on Slate’s “The Big Money” blog claims that President Obama himself has pronounced “card check” dead and said the Employee Free Choice Act didn’t have the votes to pass but that a “compromise” could work. By compromise, the article claims, the president meant a version of the bill without card check, the provision obliging employers to recognize unions after a majority of workers have signed cards. President Obama never said anything about “card check” being “dead.” He merely indicated that work is being done on developing a compromise. The same is true of Sen. Specter. As past masters of double-speak, the CP tries once again to obfuscate the issue by referring to a “compromise”. In essence, this “compromise” is regarded by labor officials, and the majority of opinion in the mass media, as anything but. By gutting EFCA, namely the right of workers to form a union by simply turning in a sufficient number of cards indicating that determination, the legislation falls short of what was expected. Last Thursday, President Obama pronounced “card check” dead, saying that the current Employee Free Choice Act didn’t have the votes to pass but that a “compromise” could work. By compromise, the president meant a version of the bill without card check, the provision obliging employers to recognize unions after a majority of workers have signed cards, rather than after an election. On the same day, Sen. Arlen Specter, newly “D”-Pa., a key swing vote, said that he, too, would support a “compromise” on EFCA: card-check-free, of course. Among the changes being discussed are dropping the card-signing provision and setting a 21-day deadline for an election to be held — about the half the median of 40 days that union elections currently take, according to people familiar with the talks. An aide for Mr. Specter said the senator is “generally supportive” of the idea that an election must be held within 21 days if the employer wants a secret ballot. The labor movement, for the last three or more years, has marched, picketed, sat in, demonstrated, petitioned and engaged in major strikes from one end of the country to the other. It mobilized for the 2006 and 2008 elections on all levels, reshaped the face of Capitol Hill, changed the Congress, changed the Senate and was critical in the election of perhaps the most pro-labor administration in U.S. history. Wow. All this actually happened? Clearly, I’ve been in a drug haze. Starting next month, or the one after that, I’m quitting acid and mushrooms for a whole week and committing myself to the New Reality. Or whatever passes for it. For those who are startled to see the Obama administration now working overtime to crush the UAW as “pro-labor” at this point, it is what one might expect from a “Marxist” group that is even more craven in its support for the president than Daily Kos, the Nation Magazine or other soft-left venues. Some on the left (ignoring the right wing talk shows and their fantastic claims about Obama’s socialist pedigree) mockingly dismiss the new president and his reform inclinations, saying that his main mission is merely to save capitalism. Even if that is true, and there is no reason to doubt it, what does it tell us — that he is neither a politician of the left nor an advocate of socialism? Well, we already knew that. Think of Roosevelt as a gardener. He sprays to kill the weeds, not to destroy the lawn. Rexford Tugwell acknowledged that the New Deal consisted almost entirely of programs initiated by Herbert Hoover: the Reconstruction Finance Corporation; fiscal pump priming; steep taxes on the rich; huge infrastructural projects to increase employment. The biggest exception of course was FDR’s campaign against financialization. It’s a judgment that raises an important question. Ignoring foreign policy and big areas of domestic policy, just concentrating on economic stabilization, and recognizing we’re only 100 days into the Obama presidency — to whom does Obama stand closer: Hoover or FDR? On the evidence so far, I would say Hoover. Except that Obama’s political skills are closer to FDR’s than Hoover’s. And, unlike Hoover, Obama would never dream of advocating a 62% marginal tax rate on top income earners. Another area where Obama stands closer to Hoover than FDR is his approach to the nature of politics. In political ideology, Obama and Hoover are pluralists who articulate a politics of the common good. FDR adopts a conflict perspective. In his first inaugural address, FDR pointed directly to those who were responsible for the great crash: “the rulers of the exchange of mankind’s goods have failed,” he said, “through their own stubbornness and their own incompetence, have admitted their failure, and abdicated. Practices of the unscrupulous money changers stand indicted in the court of public opinion, rejected by the hearts and minds of men.” “Money changers” is not a term of endearment in Christian populist discourse. It is redolent of William Jennings Bryan’s electrifying demand that Wall Street not crucify mankind. And at the same time, it looked forward to Roosevelt’s 1936 acceptance speech, when he called for the overthrow of the financial oligarchy. In a way, it is almost academic which Democrat becomes president of the U.S. Whoever it is, the CPUSA will find a way to turn that person into the second coming of FDR. Since the “Popular Front” turn of the late 30s, they have operated basically as the left wing of the Democratic Party, an institution that was born out of the Indian-killing and slave-owning Andrew Jackson presidency. If and when a genuinely radical party takes shape in the U.S., it will have to confront these yellow-dog Democrats and win people to a perspective of unremitting struggle against both the Democrats and the Republicans. One can and must pay tribute to the heroism and the sacrifices of the Communist Party activists who stood up to Jim Crow and who fought to build the CIO but seen dialectically their presence in the U.S. left today only helps to sustain the policies of the Democratic Party with its more than 150 year old traditions of racism and commitment to big business. I read the Bardian, my Bard College alumni magazine, in the same spirit that I check in on the Militant newspaper online, to see the latest affront to decency that Leon Botstein and Jack Barnes, the cult leaders of these two institutions from my youth, have cooked up. Based on the evidence of the spring 2009 Bardian, they are running neck-and-neck. In a tiny announcement, the magazine informed its readers that “Bruce C. Ratner, director of Forest City Enterprises, was appointed to the Board of Trustees.” Right off the bat, I had to assume that Ratner was cut from the same cloth as Asher Edelman, Susan Weber (George Soros’s ex-wife), and Charles P. Stevenson Jr. He was likely to have made his money through some ill-gotten gains or to have come by it through marriage as Susan Weber and fellow board member and ultra-Zionist Martin Peretz did. Edelman, a Bard graduate who the Gordon Gekko character in Oliver Stone’s “Wall Street” was based on, used to be a business partner of corporate raider Stevenson before the threat of arrest for insider trading forced him to relocate to Europe and out of the securities business. George Soros, who is a major donor to Bard College particularly when it comes to spawning colonial outposts of the college in South Africa and Eastern Europe where the benefits of free markets can be sold to budding scholars especially those who are hard-up economically, has been found guilty of insider trading in France and his firm is now being sued in Hungary for $2.2 million for manipulating the share price of the country’s largest bank. When Mr. Burns wins the Boston Celtics in a poker game, he decides to build a new sports arena in Springfield for them, but Lisa is against it as it would destroy the last bee colony in Springfield; Homer tries to solve the problem by mating the bees – with “killer” Africanized bees. It was Ratner’s intention to use a $1.1 billion dollar taxpayer subsidy to build a sports arena with seats that would be unaffordable to the very people who were funding it. Clearly he had been studying the business model of the N.Y. Yankees who were past masters at this kind of flim-flam. As is so often the case nowadays, the real estate baron seeking to impose his will on a community will bring in an architect who would not seem at first blush to incorporate predatory values, namely somebody like Frank Gehry who was hired to design Ratner’s sports complex. This architect was also hired by Botstein to design the very expensive Bard College arts center, a symbol of the school’s having arrived in the prestigious world of upscale academia. Most people, if they’ve heard of this proposal at all, believe you’ve been hired to design a sports arena, to house the New Jersey Nets, a team owned by Mr. Ratner. Anyone who’s glimpsed the drawings and models, however, knows that other, larger plans have overtaken the notion of a mere arena. The proposal currently on the table is a gang of 16 towers that would be the biggest project ever built by a single developer in the history of New York City. In fact, the proposed arena, like the surrounding neighborhoods, stands to be utterly dwarfed by these ponderous skyscrapers and superblocks. It’s a nightmare for Brooklyn, one that, if built, would cause irreparable damage to the quality of our lives and, I’d think, to your legacy. Your reputation, in this case, is the Trojan horse in a war to bring a commercially ambitious, but aesthetically—and socially—disastrous new development to Brooklyn. Your presence is intended to appease cultural tastemakers who might otherwise, correctly, recognize this atrocious plan for what it is, just as the notion of a basketball arena itself is a Trojan horse for the real plan: building a skyline suitable to some Sunbelt boomtown. I’ve been struggling to understand how someone of your sensibilities can have drifted into such an unfortunate alliance, with such potentially disastrous results. And so, I’d like to address you as one artist to another. Really, as one citizen to another. Here are some things I’d hope you’ll consider before this project advances any further. While I am sympathetic to Lethem’s pleas, I am far more dubious about the “sensibilities” of Frank Gehry that he is appealing to. In January of 2003, before I began blogging, I posted this piece to the Marxism mailing list on the topic of “Bard College, Frank Gehry, money and power” that will explain how natural it was for Bruce C. Ratner and Leon Botstein to hook up. They both have empire-building and the natural architect for that purpose in common. After a long absence following a devastating fire, The Baffler is publishing once again. [It is now defunct.] This magazine can be described among other things as analyst/critic of a growing tendency in corporate America to co-opt the avant-garde and the counter-culture. While there are abundant images that come to mind to illustrate this tendency, the Gap Ads of the 1980s featuring the homosexual, drug addict and beat novelist William S. Burroughs should suffice. The first post-fire issue of The Baffler has an article on Frank Gehry that prompts me to say a few words about Bard College, where the architect’s latest project is under construction. I would not dream of making aesthetic judgments, other than to say that it looks like a gingerbread house designed by somebody on an acid trip. I am far more interested in expanding on some of the concerns raised in the Baffler article that have as much to do with power and money as they do with art. Before getting into these questions, it would be useful to say a word or two about Bard College’s president Leon Botstein, who has run the place for 27 years now. In many ways, it really has become Botstein College while retaining the old name. It is difficult to think of any other educational institution that has been so radically recast in the image of its CEO. For that matter, it is hard to name more than a couple of college presidents who have staked out such a high profile image as Botstein. Except for the braying reactionary John Silber at Boston University and the more circumspect but equally reactionary ex-World Bank boss Larry Summers at Harvard, one would be hard pressed to name any other college president so much in the public eye. Botstein comes across as a Renaissance Man. When he is not dictating to underlings like Skiff, he is out conducting symphony orchestras (albeit mediocrely) or writing think pieces on a variety of topics in the mass media. Lexis-Nexis revealed 24 articles, including one promoting the values of self-reliance and risk-taking in the July 5, 1982 US News and World Report. Botstein would seem to share Soros’s missionary complex vis-à-vis the former Soviet Union and Eastern Europe. With money siphoned from developing economies like Thailand’s, Soros has been able to foot the bill for Bard College’s colonizing effort in St. Petersburg, namely Smolny College, which sits next door to the organizing center of the October 1917 revolution–thus bringing the counter-revolution full cycle. Claude Allegre, the former French education minister, expressed misgivings about efforts such as Smolny College: ”That our students go and study in the United States and Britain is entirely desirable, but that the Americans install their universities throughout the world, all on the same model and with the same courses, is a catastrophe.” Well, what can one say–that’s just the voice of Old Europe once again. For the New Europe of Donald Rumsfeld, handouts from people like George Soros are eagerly accepted, especially since college professors in the liberated Russia republic average about $65 per month. Despite their rather aggressive moneymaking appetites, both Soros and Levy now position themselves as friends of the left. Given the state of the world, one suspects that they are simply using a hedging strategy to protect their long-term interests. If at some point down the road the long-suffering masses decide to rid themselves of their oppressors, Soros and Levy might plead that they were with the revolution all along. Soros writes books and articles lamenting globalization, while his Open Society foundation lavishes money on various grass-roots organizations fighting for social change, especially on the Internet. For example, alternet.org got a $78,660 grant–and so on. Meanwhile, the Levy Institute at Bard constantly issues press releases and other material calling attention to irrational capitalist behavior. Old Leon Levy himself occasionally writes something for the New York Review of Books with Jeff Madrick, an Institute fellow with impeccable liberal credentials–including the October 8, 1998 “Wall Street Blues”. But to really show their “street cred”, the Levy boys went out and hired themselves a bona fide Marxist, namely Anwar Shaikh of the New School. As a research fellow at the Levy Institute, Shaikh wrote hard-hitting indictments of the capitalist system while the Levy brothers were out stripping assets in the same manner as Gordon Gecko in Oliver Stone’s “Wall Street” in order to pay for his stipend. We need a latter-day Bertolt Brecht to do justice to this sort of thing. Turning now to the Baffler article (“Build It and They Will Pay” by Andrew Friedman), one understands completely why somebody like Leon Levy would write a blank check for something like the Gehry performing arts center. In 2001, when the Board of Trustees lavished $120 million on Leon Botstein, $50 million came from Leon Levy. From that gift, $100 million was put into the general endowment, while the remaining $20 million was set aside to endow capital projects like the college’s new performing arts center. For Botstein’s purposes, this would be money well spent since Gehry’s name has instant cachet, like a Rolex watch or a Prada handbag. No sooner was the thing built, however, than the Basques started to learn what Gehry’s vision was costing them. In his book Chronicle of a Seduction: The Guggenheim Bilbao, Joseba Zulaika dissects the deal under which the museum was built. It’s a story of uneven power relations, mortgaged urban futures, and fiscal chicanery, most of which cannot be told by official sources because their agreement contains a clause forbidding public disclosure. But it seems that after a year of secret negotiations, the Guggenheim stuck the city–which lost 40,000 jobs with the demise of its largest steel plant, and which still struggles with 25 percent unemployment–with a stiff bill. By 2000, Zulaika writes, the Basques were in for $250 million–that’s $700 for each Bilbao resident. On top of that, the local government is committed to a perpetual public subsidy of $7 to $14 million a year. My own prediction is that the Gehry building at Bard will involve the same kind of waste, but as long as Leon Levy is sitting on such a huge fortune then the sky is the limit. This kind of overweening ambition seems oddly out of place both for the Guggenheim and for Bard. It is rather 1990s, so to speak. In fact, this kind of excess has begun to backfire on Thomas Krens, who is to the Guggenheim as Botstein is to Bard. Deep in debt, Krens resolved to solve things in the manner that anybody from the high-flying 90s would–he fired 80 employees, a fifth of his staff. Enron shares Mr. Gehry’s ongoing search for the moment of truth, the moment when the functional approach to a problem becomes infused with the artistry that produces a truly innovative solution. This is the search Enron embarks on every day by questioning the conventional to change business paradigms and create new markets that will shape the New Economy. It is the shared sense of challenge that we admire most in Frank Gehry. And, it turns out, an entrapment defense failed in a case involving the informant in this week’s bomb plot investigation. For the past couple of days the major media have been all lathered up over the “plot” involving four ex-cons who were supposedly ready to blow up synagogues in the Bronx and shoot down military aircraft with explosives and missiles supplied by a Jihadist group. It turned out that the explosives (fake) were supplied by the FBI as well as the suggestion to attack the synagogues in what has by now become a pattern of entrapment since 9/11. The arrests were obviously timed to help Obama push through his Bush-lite proposals to win the “war on terror” at the expense of our civil liberties. The arrested men were not al Qaeda operatives but marginal and powerless figures with no capacity to act on their fantasies. After the “ringleader” posted a message to a bulletin board about how he would like to become a martyr in Afghanistan, he was contacted by an FBI informant who put the wheels in motion. There is little doubt that the informant was paid handsomely for is dirty work. It occurred to me that it would be worth assembling a dossier on all these dodgy arrests since September 11, 2001. I told my wife as I began work that being able to access Lexis-Nexis for free is a benefit of working at Columbia University that is worth more to me than health insurance or the retirement plan. A FEDERAL JURY got its first look yesterday at a man charged with trying to sell arms to terrorists in America – and at one of the shoulder-fired missiles he said could shoot passenger planes from American skies. With the disarmed Igla SA-18 missile on a table in the Newark courtroom, a prosecutor said Hemant Lakhani tried to sell 200 of the weapons to an informant claiming to represent African terrorists operating in the U.S.
“The deal was arranged through a middleman – this man,” prosecutor Stuart Rabner said, pointing to the slight, gray-haired 69-year-old sitting at the defense table. But Lakhani’s attorney said he was entrapped by federal agents so eager to make a terrorism case they invented a phony buyer and seller – and even arranged to bring the missile into the country. It’s the riddle for which few in this old company steel town have an answer: How did the six thoroughly American Arab boys wind up indicted as al Qaeda soldiers? Yasein Taher was a star soccer player at Lackawanna High School, and Sahim Alwan was a chatty fellow who talked of Allah but also made the girls laugh. Shafal Mosed watched over his younger brothers with a paternal eye. They had many friends, black and white friends, and Alwan and Yahya Goba counseled young children over meals of barbecued chicken wings. FBI officials said that the Lackawanna men journeyed together to Pakistan and then to a terror training base in Afghanistan in May and June of 2001, before the Sept. 11 attacks. There, the officials said, the men learned to fire rifles and pistols and heard a speech by al Qaeda leader Osama bin Laden. But federal officials have not offered evidence that al Qaeda operatives were in touch with the Lackawanna men. Nor, federal officials say, do they believe these men were planning an imminent attack, here or overseas. Law enforcement officials on Thursday arrested a man who they say was plotting to blow up the Everett M. Dirksen Federal Building with a truck bomb containing ammonium nitrate fertilizer, the same material used in the Oklahoma City bombing. Patrick J. Fitzgerald, the United States attorney here, said the man, Gale W. Nettles, 66, had acted alone and had no connection to international terrorism. He did not have fertilizer that could have resulted in an explosion, Mr. Fitzgerald said. Mr. Nettles, who Mr. Fitzgerald said was embittered at the federal courts after being convicted here of counterfeiting, told a fellow inmate in a Mississippi prison of his plot last fall. The inmate alerted law enforcement officials, leading to months of intense surveillance and a sting resulting in Mr. Nettles’s arrest. In December 2003, just after he was released from prison, Mr. Nettles called a man he was told would supply him with the fertilizer, Mr. Fitzgerald said. The man was actually an undercover F.B.I. officer. Mr. Fitzgerald said Mr. Nettles started counterfeiting again to finance his plan and sold some of his fake currency to an informant for the F.B.I. By the spring, Mr. Fitzgerald said, Mr. Nettles had asked the informant to put him in contact with a member of Al Qaeda or Hamas. He was soon introduced to yet another agent, this one posing as someone with ties to a terrorist organization. Calif. terror case weakens in court; Five Muslims were arrested in June. Now only two are on trial. Some see a pattern of big cases falling apart. The FBI’s discovery last summer of an alleged al-Qaeda cell among the Pakistani immigrants in this sleepy farm town sent a shiver through California’s heartland. Federal agents and surveillance aircraft swarmed Lodi in June after the arrests of five local Muslim men who the Justice Department said were poised to commit terrorist acts. Journalists surrounded the local mosque, seeking explanations for how radical Islam could take root in the conservative San Joaquin Valley. This town of 62,000, known as the place where Credence Clearwater Revival sang about being stuck in 1969, became an unlikely jihadist hot spot. The government’s case relies largely on the testimony of its star witness, a convenience-store manager who received $230,000 in FBI payments for infiltrating the Lodi mosque to target its conservative clerics. The informant, Naseem Khan, stunned the court when he testified that he had seen Osama bin Laden’s top deputy, Ayman al-Zawahiri, at the Lodi mosque in 1999. Experts say it is unlikely the terrorist was in America then. The two Lodi imams who the FBI suggested were al-Qaeda’s conduits of instructions were never charged with terrorism. They and one of their sons chose deportation rather than fighting alleged visa violations. “If they really were involved in any kind of terrorism, they wouldn’t be allowed to leave the country voluntarily,” said their attorney, Saad Ahmad. A Pakistani immigrant accused of plotting to blow up the Herald Square subway station in 2004 took the stand in his own defense yesterday and said he never wanted to carry out an attack until he met a paid police informer who treated him like a younger brother and inflamed his anger against the United States. The defendant, Shahawar Matin Siraj, 23, told the jury in United States District Court in Brooklyn that the informer had shown him dozens of images, including pictures of prisoners being abused at the Abu Ghraib prison in Iraq and a video of the fatal shooting of a 12-year-old Palestinian boy who died in his father’s arms in Gaza. Mr. Siraj testified for about four hours under questioning by one of his lawyers, Khurrum B. Wahid. Later in the day, a prosecutor took over, throwing rapid-fire questions at Mr. Siraj about his earlier statements on suicide bombings and the United States. The cross-examination will continue today. The defense has acknowledged that Mr. Siraj took part in a conspiracy. Mr. Wahid yesterday tried to bolster the defense argument that the plot was driven by the informer, Osama Eldawoody. He asked Mr. Siraj who he felt had been the leader of the conspiracy, which also included another young man who pleaded guilty and testified for the prosecution. The seven men who were arrested here last week on terror charges were shown Friday on undercover videotapes solemnly reciting oaths of loyalty to Al Qaeda, repeating the words that an F.B.I. informant had given them to say. A terrorist plot to attack transit tunnels under New York’s Hudson River was broken up in its early planning stages, U.S. authorities said Friday, with three suspects arrested overseas, including a Lebanese man the FBI said was an al-Qaeda follower. The FBI uncovered the plot last summer and intercepted e-mails and chat-room postings on Web sites used to recruit Islamic terrorists. U.S. authorities turned in April to Lebanese officials for help in tracking one of the suspects, Assem Hammoud. The 31-year-old man, who the FBI said was the group’s leader, was arrested in Beirut on April 27 and has confessed, officials said. Hammoud was arrested before leaving for four months of training in Pakistan, and Lebanese investigators discovered details of a terrorist “project” on his computer that included a map “with a lot of details about New York,” Lebanon’s acting Interior Minister Ahmed Fatfat said in a telephone interview. But authorities said there was no evidence that the plotters had taken any actions, such as buying explosives or sending money, and cast doubt on the feasibility of initial reports, which first appeared in the New York Daily News, that terrorists sought to flood Lower Manhattan and the Financial District by bombing tunnels. “You are in the belly of the enemy,” the man from Canada warned, and cautioned his audience to be careful whom they spoke to. “The oppressors are everywhere.” Once it was clear they all understood, the jazz musician bent to his knees, clutched the visitor’s hand and took a solemn oath. He pledged to be “one of Islam’s soldiers … on the road to jihad.” The doctor allegedly did the same. Then they each embraced the oath giver, the final step in Al Qaeda’s sacred initiation ritual. An audiotape of that extraordinary scene played in a federal courtroom last week as one of the initiates, Dr. Rafiq Sabir, a graduate of Columbia University Medical School, stood trial on federal charges that he provided material support to terrorists. What Sabir and the others didn’t know when they attended the ceremony two years ago was that the man administering the oath was not really a jihadist, but Ali Soufan, an undercover FBI agent who had spent the better part of his career hunting Qaeda operatives. Details emerge in terror sting; An FBI affidavit tells how agents set up alleged plotters of an attack on Fort Dix. Many questions remain, however. Two of the terror suspects arrested at an apartment complex in Cherry Hill thought they were meeting with a “gun dealer” who was going to sell them assault rifles they hoped to use in launching an attack on Fort Dix. Instead, the FBI was waiting. The sting operation at the Hampshire Houses, a multi-unit complex off Cooper Landing Road, was part of a coordinated effort by federal and state authorities, who scooped up six suspects at four different locations on Monday night. The arrests capped a 16-month undercover operation that was partially detailed in an FBI affidavit. But there remain many questions in the high-profile case – a case built around paid informants, secretly recorded conversations, an unsung hero, and mysterious operatives whose roles remain uncertain. A convicted drug dealer seeking a reduced sentence helped thwart an alleged plot to blow up fuel tanks and destroy New York City‘s Kennedy International Airport, papers filed in the case say. The paid informant, described in a criminal complaint unsealed Saturday as “the Source,” made four surveillance trips to the airport in January with Russell Defreitas, a former Kennedy Airport cargo handler who was the plot’s alleged leader, the complaint says. The informant also recorded conversations, downloaded airport images from Google Earth and traveled with Defreitas, 63, to Guyana to enlist the aid of an armed radical Muslim group, Jamaat al Muslimeen, legal papers charge. Defreitas and three other men, two Guyanese and a citizen of Trinidad, were charged with conspiring to destroy the airport by blowing up fuel lines, fuel tanks and terminal buildings. Two of the three were in custody in Trinidad, and the third still was being sought. The case is at least the fifth time in two years in which the U.S. government has relied on paid informants, some recruited by police, to bring terrorism-related charges against U.S.-based Muslims, according to federal court records. Michael Curtis Reynolds says he’s a patriot. Federal authorities say he’s a terrorist. The FBI believes that the unemployed Wilkes-Barre man tried to conspire with al-Qaeda to wreck the American economy. Agents say Reynolds plotted to blow up the Trans-Alaska Pipeline, a Pennsylvania pipeline, and a New Jersey refinery. The sensational allegations, disclosed in a federal transcript obtained by The Inquirer on Friday, reveal a convoluted plot that includes cyberspace intrigue, an elaborate FBI sting, and a clandestine money-drop on a deserted Idaho road. Described by his former father-in-law as a “John Wayne wanna-be,” Reynolds has a string of bad debts and criminal convictions – including one for attempted arson. His last known address was Room 205 at the Thunderbird Hotel in Pocatello, Idaho. In the FBI sting two months ago, Reynolds was drawn to a meeting with a purported al-Qaeda operative about 25 miles from the hotel, where he expected to receive $40,000 to finance the alleged plot. The al-Qaeda contact was actually Shannen Rossmiller, a 36-year-old judge who lives in Conrad, Mont. She was working for the FBI. This is not Rossmiller’s first sting. She regularly monitors extremist Muslim Web sites, searching for potential terrorists. In 2004, she helped win a conviction against a National Guardsman in Tacoma, Wash., whom she met online. Rossmiller met Reynolds online last fall. They have a thread going on over there about the Jared Diamond/New Yorker scandal. I tried to post a link to my articles but the moderators blocked it. I stopped posting there in 2006 after they removed a comment about Yugoslavia that did not fall within their State Department liberalism parameters. Here’s what I had to say about it at the time. Now I don’t bother posting there except under exceptional circumstances. Not long after Peter Camejo died, they posted an item about him that I decided to follow up with a link to something I had written. I had only known Peter for close to 40 years and considered myself a disciple. This time I wanted to post some links to what I had written about Jared Diamond and the New Yorker only because I had been in contact with Rhonda Shearer long before the news of the scandal broke. She considered my articles on Diamond both before and after the scandal useful and I thought that people who read Crooked Timber might as well, at least those unlike about half the commenters who hate Rhonda Shearer and adore Jared Diamond. I really wondered what got into the head of the moderators when my post showed up. Did they think that by releasing it they would be endorsing unrepentant Marxism? The guy who wrote the piece on Diamond there is the chairman of the philosophy department at Albany State, one Jon Mandle. He is the author of “What’s Left of Liberalism? An Interpretation and Defense of Justice as Fairness”, a book that ostensibly prepared him for the role of censor. Drop him a line at mandle@albany.edu and let him know what you think of his actions. Although at first blush far removed thematically from his Samurai trilogy, Yoji Yamada’s “Kabei: Our Mother” has many of the same elements. This is a tale of how the wife of a Japanese professor imprisoned in 1940 for “thought crimes” struggles to raise her two young daughters under the most difficult of circumstances. It is a searing attack on the authoritarianism and stupidity of a social system that retained many of the feudal traits of the period depicted in the trilogy. It is also an embrace of the decency and the courage of humble people being crushed underfoot by a system operating through a combination of repression and intense social pressure. At the age of 78 and now having made his 74th movie, Yoji Yamada demonstrates once again his kinship with such members of the great humanist tradition in filmdom shaped by radical politics—including his countryman Akira Kurosawa, Senegal’s Ousmane Sembene and India’s Satyijat Ray. Sharing the meager circumstances of the underemployed Samurai of the trilogy, Shigeru Nogami (Miku Sato) is a one-time philosophy professor fallen on hard times. He is 3 months behind on his rent and has just learned in the opening scene that his latest book has been turned down by a publisher. Unlike most of his countrymen swept up by the ultranationalist fervor of the ruling party, he opposes the invasion of China and has the courage of his convictions to say so publicly. He has the misfortune to take philosophy’s teachings seriously, a flaw not shared by fellow academics who learn to get along with the system, just as they were doing in Nazi Germany. A day or so later, he and his family are woken in the middle of the night by a pounding on the door. The cops have come to investigate a “thought crime” and pour through his books and papers looking for evidence. Convinced that Nogami is a traitor, they tie him up with rope, take him to police headquarters, and throw him into a holding cell. The other prisoners, discovering that he is some kind of “red”, try to make him as comfortable as possible. Unlike her husband, Kayo Nogami is apolitical and only has the hope that he will be released from jail and returned to the happy if impoverished household that they share with their two children, a 12 year old girl named Hatsuko and her 6 year old sister Teruyo who provides the narrative and point of view throughout the film. As such, the film evokes Fellini’s “Amarcord”, another film about life under fascism seen through the eyes of a child. Unlike “Amarcord”, the emphasis is less on lyrical youthful evocations (although there is much of that) than it is about injustice and the struggle for dignity and freedom. Indeed, Teruyo Nogami was a real person and this film is based on her semiautobiographical novel about her wartime experiences. Although the film does not make a point of this, the adult Teruyo Nogami worked with Akira Kurosawa for over 40 years in different capacities, including supervising the script of “Rashomon”. As alluded to above, Kurosawa and Yamada are kindred spirits. Before the Japanese state had converted itself into an authoritarian war machine, Kurosawa traveled in CP circles as a youth. Some of his early student works were “socialist realism” exercises. After WWII began, he went to work in the Japanese film industry turning out propaganda films that glorified test pilots and female factory workers. Unlike Teruyo Nogami, Kurosawa succumbed to social pressure. But one assumes that his early training in socialist realism acquitted him well, just as it did American CP’ers in the film industry. Kurosawa was extremely rueful about his role in all this. Perhaps shame motivated his desire to create a new kind of film for postwar Japan, one that would criticize a society that had become adrift. Although it no longer celebrated martial values, it still lacked a higher purpose. His youthful leftist beliefs combined with his family’s aristocratic sense of ‘noblesse oblige’ led to the creation of distinctly Kurosawan type of film, one in which a lone individual struggled to define a personal ethos against a callous and self-centered society. Clearly, Kurosawa’s celebration of the selfless Samurai hero attacking a vicious feudal system and Nogami’s novel about WWII repression resonated with Yamada’s own values and experience. Program notes for a Yamada film shown at the Film Forum in 1982 stated that he was “’a member in good standing of Japan’s Communist Party”’ and usually tried to make some reference in his films to man’s disaffection with society. What attracted me first was the childhood memoir by Teruyo Nogami. Her father was actually arrested under the Peace Preservation Law (which had the goal of clamping down on communists, labor activists and opponents of Japan’s militarism) and spent time in jail. That’s what Japan was like in 1940 and 1941, but Japanese today don’t know this. I wanted to rekindle their memories. Those were frightening times, when Japan started the Pacific War with an unstoppable wave. Japan should have remained the one country in the world with no military and a prohibition against war (in the Constitution). Now Japan is going along with America and the Bush administration. I have doubts about whether that’s right. For those who want to see film-making at its best, as well as a celebration of the values we cherish in our own struggle with another barbaric social system, a visit to the Quad Cinema in New York is not to be missed. For serious scholars of film and politics, as well as amateurs like me, the Turner Classic Movie channel (TCM) is an invaluable resource. While most of the time it is recycling warhorses like “Citizen Kane” that can be rented from Netflix, you will occasionally be able to watch some extraordinary movies that are not available in home video. Last night I chanced across a couple that were part of a series occurring this month titled “Race and Hollywood: Latino Images in Film”. Last night’s movies were selected and introduced by Chon A. Noriega, professor of cinema and media studies at UCLA and director of the UCLA Chicano Studies Research Center. The two that I saw had deep associations with the left, either positive or negative. 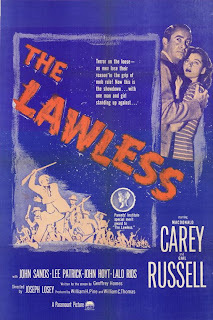 “Lawless”, a 1950 movie about anti-Chicano racism in a California town, was directed by Joseph Losey, who was blacklisted shortly afterwards and forced into exile in London. Communists in Hollywood tended to make movies that had only a glancing connection to Marxism, preferring instead to package New Deal populism as mainstream entertainment. Losey took another tack. Despite conforming to Hollywood convention in many ways, “Lawless” is about as hard-hitting an indictment of anti-Latino racism as I have ever seen. Only 5 years after “Lawless” was made, Hollywood had gone full swing in an anti-Communist direction making it impossible for directors like Joseph Losey to make a living. A product of this period was the 1955 “Trial”, a movie that depicts Communists in the worst possible light. As the title implies, the film is a courtroom drama involving a Chicano youth who is being railroaded for sexually assaulting and then murdering a white classmate. His defense attorney is a well-meaning but inexperienced liberal hired by an experienced but utterly cynical and corrupt lawyer who is in charge of fund-raising through his CP connections. Both “Lawless” and “Trial” feature race riot and lynch mob scenes that were very much in the recent memory of a 1950s audience. From the Zoot Suit confrontations of the 1940s to the attack on the Paul Robeson concert that Chon A. Noriega described as an inspiration for the scenes in “Lawless”, these movies were describing social reality. Shot on location in Marysville and Grass Valley in late 1949 for a mere $407,000 (Losey once claimed he had but $150,000 to spend, but this is not borne out by studio documentation), The Lawless takes place in a fictional California small town riven, like so many real ones, into two classes: the middle class whites congregate in Santa Maria, a self-proclaimed “Friendly Town.” The local fruit industry depends on low-cost labor, provided in large measure by Mexican immigrants, derisively known as “fruit tramps,” living in a shantytown called Sleepy Hollow. They work long hours for meager pay, are reflexively considered unreliable layabouts and eyed with suspicion by the police. In any ghetto, the hardships of life can wear down people’s civility, and so Sleepy Hollow has its share of problems and violence—which community organizers like intrepid journalist Sunny Garcia (Gail Russell) work to resolve. But when angry young men from across the tracks come to Sleepy Hollow full of anti-Mexican resentment, looking to start a fight, even the noblest of intentions fall short. For those of us living today in the post-Civil Rights era, when the biracial son of an African father can ascend to the highest office in the free world, it can be all too easy to forget how recent were the struggles that created this world. SHENANDOAH, Pa. — Ten days ago, shortly after two white teenagers were acquitted of the most serious charges in the beating death of Luís Ramírez, a Mexican immigrant, several white students at the local high school told Felix Bermejo that he would be the next person to get a beating, he says. Last Sunday, Eileen Burke, a former Philadelphia police officer who found Mr. Ramírez unconscious on the ground outside her Lloyd Street home after he was beaten, found that her car had been egged after she was quoted in a local newspaper saying she believed that the police had mishandled the investigation. Last week, a fight broke out between a group of white teenagers and a group of black and Latino teenagers and someone pulled out a gun, an escalation that several onlookers said never would have happened before. The trial stemming from Mr. Ramírez’s death ended nearly two weeks ago, but tensions continue to boil in this small Pennsylvania coal town of 5,100 northwest of Philadelphia, where Mexicans and other Latinos have been settling in search of affordable housing and work in the mines or apple and peach farms. It was no wonder that courtroom dramas were all the rage in the 1950s; television had brought the real thing into millions of viewers’ living rooms via the broadcast of the Army-McCarthy hearings. MGM, under Louis B. Mayer, had been virulently anti-Communist, but with Mayer long ousted and the studio under the new Dore Schary regime, the climate was positively liberal. McCarthy’s deserved humiliation and defeat on live TV may not have ended the blacklist; however, it set the tone for a lengthy healing process that would eventually span more than two decades to vindicate many of the political victims. It seemed apt that Metro would take on a project encompassing a number of controversial topics, and Trial (1955), based on the best-selling novel by Don Mankiewicz (who also penned the taut script), zeroed in on every falsehood perpetrated by the dreaded HUAC moniker. In fact, “Trial” contains a scene that is even more fantastic than anything Joe McCarthy could have cooked up. The lawyer for the victimized Chicano youth is invited to speak at a rally in New York that was organized under the auspices of the “All Peoples Party” and Barney Castle, the shady lawyer who hired him. It makes the Communists who built and attended the rally look like a mixture of fools and guttersnipes, who only donate to the cause because higher-ups in the party tell them to. What’s even more unlikely is Barney Castle’s failure to make a single political statement throughout the film. He approaches the entire project as a way to siphon off funds for his personal gain. In the film’s climax, the defense attorney played by Glenn Ford confronts Castle (Arthur Kennedy) who has decided to engineer a guilty verdict in the courtroom for the Chicano youth since “the party” decided he would be more useful as a martyr than a free man. In the final moments of the movie, as Castle becomes more and more of a red scare bogeyman, you don’t know whether to laugh or to scream at the images on the screen. This, of course, is exactly the reaction that most people have to these 1950s McCarthyite movies. For what its worth, Don Mankiewicz, who wrote the novel that “Trial” is based on, also penned the original TV pilot scripts for Star Trek. Go to http://www.tcm.com/2009/lif/index.jsp to see the trailer for “Lawless”. Unfortunately, none is available for “Trial”. JERUSALEM — Israel is quietly carrying out a $100 million, multiyear development plan in some of the most significant religious and national heritage sites just outside the walled Old City here as part of an effort to strengthen the status of Jerusalem as its capital. The plan, parts of which have been outsourced to a private group that is simultaneously buying up Palestinian property for Jewish settlement in East Jerusalem, has drawn almost no public or international scrutiny. However, certain elements related to it — the threatened destruction of unauthorized Palestinian housing in the redevelopment areas, for example — have brought widespread condemnation. But as Pope Benedict XVI prepares to visit Christian sites here this week and as the Obama administration promotes a Palestinian state with parts of Jerusalem as its capital, Israeli activity in the area, known as the holy basin — land both inside and just outside the Old City — will be cause for growing concern and friction. The parts of the city that are being developed were captured in the 1967 Middle East war, but their annexation by Israel was never recognized abroad. At the same time, there is a battle for historical legitimacy. As part of the effort, archaeologists are finding indisputable evidence of ancient Jewish life here. Yet Palestinian officials and institutions tend to dismiss the finds as part of an effort to build a Zionist history here. You are a bunch of god-damned fascists. And I say that as a NY Jew who was bar mitzvahed. Also, as an American Jew who was Bar Mitzvah’d and later moved to Israel , I was saddened by your email. If there is one thing that Jews have learned over the last 100 years is that the popular media does not have Jewish interests in mind, often is grossly exaggerated or completely wrong, and has in numerous cases caused pogroms against our people. From 1939 – 1945 the German newspapers printed hundreds of innaccurate stories about our people, that probably caused certain Jews to call their own people fascists, despite the fact that fascism has never been more apparent than in those who wrote the reports in the first place. I can tell you first hand that there is nothing fascist about the City of David or our work. We work according to the law, and with the dream of rebuilding the most historic Jewish landmark in the world. Never in the last 2,000 years has freedom of access to holy sites in Jerusalem been guaranteed to people of all religions like it is today. We may be a small people throughout the world, but do we have to cringe from our smallness. Are we not allowed to diplay the beautiful religion, history, and dynasty that our people are a living model for? I hope you will reconsider your words, and your debt to the hundreds of ancestors that came before you, against the most horrific conditions, so that you can call yourself “Jewish” today. Also, as an American Jew who was Bar Mitzvah’d and later moved to Israel , I was > saddened by your email. If there is one thing that Jews have learned over the last 100 years is that the popular media does not have Jewish interests in mind, often is grossly exaggerated or completely wrong, and has in numerous cases caused pogroms against our people. Oh please. The American media is overwhelmingly pro-Israel. Do you actually read American newspapers? They are filled with pro-Israel editorials and reporting. There is no people on earth more hated than Arabs. They are the Jews of our time. Hollywood makes movies about Arabs depicting them as lower than insects. We may be a small people throughout the world, but do we have to cringe from our smallness. Are we not allowed to diplay the beautiful religion, history, and dynasty that our people are a living model for? I hope you will reconsider your words, and your debt to the hundreds of ancestors that came before you, against the most horrific conditions, so that you can call yourself “Jewish” today. Archaeologists, including those from Israel, cast doubt on much of the historical accuracy of the Bible. Are you one of those people who still believe that Moses parted the Red Sea? Ridiculous. All the best, and by the way if you decide to return to your people one day, we will be here for you. In the meantime, I hope you find deep meaning in solving the problem’s of everybody BUT YOUR OWN PEOPLE. Archaeologist Dr. Eilat Mazar of the Hebrew University announced the find of a clay bulla (seal impression) inscribed with the name “Gedaliah Ben Pashchur” from her recent archaeological excavation at the City of David. The name appears in the Book of Jeremiah (38:1) in the same sentence as the mention of “Yehuchal Ben Shelamayahu” whose name was found on an identical clay bulla as part of an earlier phase of the same archaeological dig in 2005. This is the first time in the annals of Israeli archaeology that two clay bullae with two Biblical names that appear in the same verse of the Bible have been found in the same location. The fact that these two bullae were found on the site indicates that the building in which they were found was used by the king, or at least by his ministers, until the destruction of the First Temple“And Shephatiah the son of Mattan, and Gedaliah the son of Pashchur, and Yehuchal the son of Shelamayahu, and Pashhur the son of Malchiah, heard the words that Jeremiah spoke unto all the people, saying:” (Jeremiah 38:1) Yehuchal the son of Shelamayahu and Gedaliah the son of Pashchur where both ministers of King Zedekiah (a descendant of King David and the last king to rule in Jerusalem before the destruction of the First Temple). They unsuccessfully plotted to kill the prophet Jeremiah by throwing him into a pit. Pashchur, Gedaliah’s father, may have been the deputy chief priest of the temple that “smote Jeremiah the prophet, and put him in the stocks that were in the upper gate of Benjamin, which was in the house of the Lord.” (Jeremiah 20:3) Dr. Eilat Mazar completed the third phase her excavation of what she believes to be Kind David’s palace at the City of David site a month and a half ago and is currently sifting through the remains of that excavation. It was in this material that she found the seal. Much of the rubble from the dig has yet to be sifted and it is likely that more discoveries will be made. The Ir David Foundation was the principal sponsor of the excavation, together with the Israel Antiquities Authority, the Hebrew University, and the Shalem Center. The Bible’s account of King David is so well known that even people who rarely crack the Good Book probably have an idea of his greatness. David, Scripture says, was such a superb military leader that he not only captured Jerusalem but also went on to make it the seat of an empire, uniting the kingdoms of Judah and Israel. Thus began a glorious era, later amplified by his son King Solomon, whose influence extended from the borders of Egypt to the Euphrates River. Afterward, decline set in. Yet what if the Bible’s account doesn’t fit the evidence in the ground? What if David’s Jerusalem was really a rural backwater — and the greatness of Israel and Judah lay far in the future? Statements like these have earned Mr. Finkelstein — who is leading excavations at Megiddo, a vitally important site for biblical archaeology in northern Israel — a reputation as a fascinating but controversial scholar. His reports from Megiddo that some structures attributed to Solomon were actually built after his reign have touched off fierce debate in Israel. Within a larger context, what he says reflects a striking shift now under way in how a number of archaeologists understand Israel’s past. Their interpretations challenge some of the Bible’s best-known stories, like Joshua’s conquest of Canaan. Other finds have turned up new information that supplements Scripture, like what happened to Jerusalem after it was captured by the Babylonians 2,600 years ago. In an interview by e-mail from the Megiddo site, Mr. Finkelstein said that not long ago, “biblical history dictated the course of research and archaeology was used in order to ‘prove’ the biblical narrative.” In that way, he said, archaeology took a back seat as a discipline. “I think that it is time to put archaeology in the front line,” said Mr. Finkelstein, the co-author with Neil Asher Silberman of “The Bible Unearthed,” to be published in January by The Free Press. His reference to past practices can be illustrated by a remark by Yigael Yadin, an Israeli general who turned to archaeology and who once spoke of going into the field with a spade in one hand and the Bible in the other. In her book, Ms. Marcus — formerly the Middle East correspondent for The Wall Street Journal — notes that Mr. Yadin believed he had unearthed evidence in the ruins of a place called Hazor that corroborated the biblical account of how that Canaanite city had been destroyed. The Bible says Hazor fell to invading Israelites led by Joshua. But these days, she said, an increasing number of archaeologists have come to doubt that Joshua’s campaign ever took place. Instead, they theorize that the ancient Israelites emerged gradually and peacefully from among the region’s general population — a demographic evolution, not a military invasion. “And that would explain how their pottery is so similar to the Canaanites’, and their architecture, their script,” Ms. Marcus said. Asked how such conclusions have been received in Israel, Mr. Finkelstein replied that they had produced a “quite strong and negative” reaction. But the anger, he said, was coming not from strictly Orthodox Jews (“who simply ignore us,” he said) but from more secular Jews who prize the biblical stories for their symbolic value to modern Israel. “I think that the young generation — at least on the liberal side — will be more open and willing to listen,” he said. Still, considerable disagreement exists among archaeologists on how to interpret many recent finds. And the new theories about ancient Israel are emerging against the backdrop of a raging dispute over so-called biblical “minimalists,” scholars who argue that biblical accounts of early Israel, including the stories of David and Solomon, have little if any basis in history. This debate was recently fought out in a lively issue of the Biblical Archaeology Review, a bimonthly magazine published in Washington, in which one of the minimalists, the British scholar Philip Davies, wrote that biblical accounts of early Israel were purely theological, not historical. In response, a major critic of the minimalists, the American archaeologist William Dever, wrote that ample physical evidence pointed to early Israelites living in the region’s highlands 3,200 years ago, two centuries before the time of David and Solomon. Yet while archaeology is challenging some of the biblical narrative, it is also adding to it. At Megiddo, Mr. Finkelstein said, he found that the period 2,900 years ago — the century following the rule of Solomon — was a far more interesting and powerful time for the Kingdom of Israel than the Bible says. Another tantalizing discovery, in 1993, turned up a stele with an inscription referring to the “House of David,” the first real evidence that refers to the biblical king. Still other recent excavations have provided compelling new evidence about the lives of the residents of Jerusalem 2,600 years ago, when they were besieged by the Babylonian army, and about the nearby people of ancient Judah who did not go into exile in Babylon. Get a better idea of the debate and of the facts. Finkelstein is at least as pigeon holed as Dr. Mazar and much much more. If you want to be taken seriously by Jews in the U.S., you have to stop pretending that every view that disagrees with your own is illegitimate. Every sect always believes its own “truths”, from the Mormons to the Catholics but it is always best to consult sources that don’t have a stake in the outcome. As http://www.aish.com freely admits, its name is Hebrew for “Fire of Torah”. When you refer me to a website like this, it is like having a global warming skeptic refer me to Rush Limbaugh’s website. In addition to demolitions, plans under way for a vast tourist complex near the Old City – as reported by Ir Amim, another Israeli human rights group – represent a looming Israeli footprint on largely Palestinian areas. Its proposed location, in the shadow of holy sites such as the Dome of the Rock and the Western Wall, make the project potentially explosive and suggest a renewed effort to prevent the establishment of an official Palestinian sector in Islam’s third-holiest city. One of the partners in the $100 million development plan is a private group named Elad, which focuses on buying Palestinian property in East Jerusalem and moving settlers into Arab neighborhoods. Several human rights organizations say there is an obvious link between the ramping up of demolition orders and Barkat’s plans to develop the tourist complex in East Jerusalem – focusing on Jewish history in the area known in Hebrew as Ir David (City of David) and as Silwan in Arabic. According to Ir Amim, which tracks policy affecting both Israelis and Palestinians in Jerusalem, the under-the-radar project is motivated by a right-wing ideological goal of cementing Israeli sovereignty in East Jerusalem. That plan, which has not been made public, appears to be focused on moving Palestinians out of the historic heart of Jerusalem – areas near the Old City – while allowing some Palestinian growth in much more peripheral areas, such as those closer to the West Bank city of Ramallah. “All of these things are linked, though not every house demolition follows this logic,” says Sarah Kreimer, the deputy director of Ir Amim. In reaction to such complaints over Barkat’s performance so far, he announced last week that there would be an additional 13,500 additional housing units allowed for East Jerusalem’s Arab residents, who are feeling the pinch of overcrowding in Arab neighborhoods.